Leader of the Israelite sect involved in the Bulhoek massacre of 24 May 1921. When government police ordered Mgijima's followers to remove their settlement from crown lands, they resisted and police opened fire, killing approximately 200 people. Mgijima was subsequently sentenced to six years’ hard labour but served only two years. Enoch Mgijima was born in 1868 at Bulhoek, the youngest of nine children – five girls and four boys. His father, Jonas Mayekiso Mgijima, was a successful farmer. The children were brought up as Wesleyan Methodists. Mgijima’s brothers studied at Lovedale Institute and Zonnebloem College in Cape Town. Mgijima completed grade five at a local school but severe headaches forced him to remain at home and he did not go on to Lovedale. As a result he became a farmer and hunter of small game. Due to his Wesleyan upbringing, Mgijima also became a lay preacher and independent evangelist, for which he gained quite a reputation in the region. Mgijima tried to ignore the calling but after some time he accepted his calling and developed a sizeable following as an evangelist. Mgijima began to reveal his vision of the immanent end of the world. 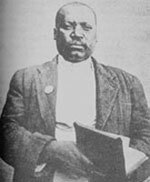 When he saw Halley’s Comet in April 1910, Mgijima took this as a sign that God was angry with humans and that they should return to their Old Testament beliefs. As Mgijima gained an independent following he began to move away from the Wesleyan Methodist Church. He finally broke away in 1912 and in November of that year he began baptising his followers in the Black Kei River near his home at Ntabelanga. Because of his personal identification with the Hebrews of the Old Testament, he decided to call his followers “Israelites”. After his breakaway from the Wesleyan Methodists, Mgijima decided to join the Church of God and Saints of Christ in South Africa, a small church based in the United States of America. Towards the end of 1912 Mgijima predicted that the world would end by Christmas and would be followed by 30 days of rain. As a result of his prediction, the Israelites stopped working their fields. However, the end did not come. Over the years his visions became more and more intense. The Church of God and Saints of Christ asked Mgijima to renounce his visions as they could not condone the preaching of conflict and war. When he refused to do so he was excommunicated. As a result the church split into two factions – the Church of God and Saints of Christ and Mgijima’s faction, the Israelites. Mgijima’s most significant prophecy came in early 1919 during one of his church services. He stood in front of his tabernacle and spoke four words, “Juda, Efrayime, Josef, nezalwane (Judah, Ephraim, Joseph and brethren)”. According to his followers, Israelites all over the country heard these words and understood that they were to come to Ntabelanga, their prophet’s holy village, and await the Lord’s coming. Eventually 3000 people arrived in Ntabelanga. This caused serious problems with the White authorities as the Israelites were erecting houses on government land without registering themselves or paying taxes, as was required by law. After a year of failed negotiations to get the Israelites to leave, on 24 May 1921 the Israelites and police clashed. Approximately 200 Israelites were killed, more than 100 wounded and 141, including Mgijima, were arrested. This incident became known as the Bulhoek Massacre. In November 1921 the trial of the 141 Israelites was held in Queenstown. They were charged with sedition or “violent and forcible conduct against the authority of the state” (Edgar, 2010: 37). The trail lasted two weeks and all 141 were found guilty by the presiding judge, Thomas Graham. Mgijima, his older brother Charles, who was his right-hand man in the Church, and one other were sentenced to six years’ hard labour at De Beer’s Convict Station in Kimberley. One hundred and twenty-nine Israelites were sentenced to between 12 and 18 months of hard labour while the rest were given suspended sentences. Charles died in prison and Mgijima was released in 1924. He died on 5 March 1928 at his home in Ntabelanga.